Could This Be the Return of the Hanson Brothers Line ? Josh Gratton gets the best of Ole-Kristian Tollefsen while competing for the Nashville enforcer job in preseason action against Columbus on 9-27-08. The Nashville Predators surprised everyone by picking up pugilist Nick Tarnasky this afternoon. Since the trade of Darcy Hordichuk to Vancouver, the Preds appear to be building a collection of grinder line type tough guys. In a very odd move today, David Poile traded a conditional 2009 sixth round draft pick to the Lightning for enforcer Nick Tarnasky. Tarnasky was the victim of numbers in an overcrowded field of high dollar bodies in Tampa. Why the Preds helped ease their burden is anyone’s guess at this point. He averaged about 7 minutes per contest in 157 games over the last two seasons for Tampa. Saturday night’s game against Columbus appeared to be a contest where Josh Gratton and Triston Grant were auditioning for the enforcer spot on the team. Both were impressive in separate bouts and held their own on the ice. Rookie Kelsey Wilson didn’t fare as he fel victim to a one round knockout in his session on Thursday night after getting quickly pummeled by one of the Thrasher beasts. So why now do the Predators have three enforcer types in a group of 19 uninjured forwards competing for what you will assume will be 14 positions on the 23 man opening day squad? Will they all play on the same line? Will it be like the return of the Hanson Brothers line? That would be fun! Hopefully, we will hear the wisdom of all this stockpiling of brute talent soon. For now, I am baffled. One thing that worries me is our past record with goalies. Two seasons ago, Thomas Vokoun was struggling coming back from an injury. So Chris Mason played the majority of the games that season, in which he did amazing throughout them. Whenever Trotz would play Vokoun, we would lose and everyone would get pissed. Noticing this, Trotz gave Mason the number one goalie spot. Looking at Mason’s season, David Poile thought that Chris Mason was sufficient enough to be their number one. So he traded Thomas Vokoun off to Florida. Little did he know that when given the number one position in the 07-08 season, Mason would completely blow it. Given that Mason wasn’t doing so hot, Trotz decided to play Ellis for a few games. Ellis went on a six game winning streak right off the bat. I remember whenever Trotz would start Mason and he would get scored on early in the game, you would hear shouts from the fans saying stuff like “Ellis could’ve stopped that!” and “Put in Ellis! What the hell are you thinking about? !” (The fans I heard most of the stuff coming from was mainly my father, my brother and I.) Eventually Trotz gave up on Mason and gave Ellis the number one goalie spot. Through the rest of the season Ellis was solid and went on to play 129 minutes of shutout hockey. In the playoffs Ellis had the best save percentage of all the goalies. He also racked up 225 saves during the 6 games against the Red Wings in the first round. 90 of those 225 were stopped in the last two games. I feel that Ellis might turn out to be another Chris Mason or Thomas Vokoun. I hope I’m wrong. The Predators are in a different situation this year than in their recent history in that there are actually several open roster spots on their NHL roster. With the freak out of Alexander Radulov, injuries to Steve Sullivan and Jed Ortmeyer, and several departures including Chris Mason, Marek Zidlichey, Jan Havlic, Martin Gelinas, Darcy Hordichuk, and Brandon Bochenski, there is serious competition in camp to stick with the Preds on opening day. Many folks who don’t understand the dynamics of the Predators situation or don’t realize the strength of the Preds system mistakenly have been screaming “Fire sale” all summer. The reality is if you review the above list of departures, with the exception of Radulov, all of the players have reached their potential and have little additional upside. It goes to the theory of buying low and selling high. The Predators system is full of many talented youngsters that need an opportunity to play at a higher level. David Polie would much rather be giving the Pred’s skilled future players an opportunity to compete rather than clogging the roster with higher paid, role players with little potential to do more than they have. Many would say this explanation translates to a ‘fire sale” but I disagree. One area of the Predators lineups that appears set is the Defense. Seven of the top eight from last year have returned and barring injury would all make the roster. Of the youngsters the one player that has really distinguished himself is 19 yr old Vancouver Giants captain Jonathon Blum. He played well in the two rookie games earlier this week and played with confidence in the Preds opener last night. He is also scheduled to get another start tonight in Columbus as the only non-veteran in the six blue liners making the trip. I would imagine he is having the time of his life getting this much ice time before returning to his junior team for the season. He will return sooner than later after another year in Junior and playing in the world juniors in December. When the Preds go to Milwaukee for extra defensemen, the first call ups will probably be from a group including Cody Franson, Teemu Lasko, Aleander Sulzer, and Robert Dietrich. All have played well in the rookie games as well and Lasko and Sulzer both carried themselves well in the game last night. On the surface it would appear that the Predators are set in Goal with Dan Ellis at one and Pekka Rinne as the back up. After a shaky start last night Rinne may not be as much of a lock as it once appeared. They also have Drew MacIntyre on the roster who would be considered the third man on the depth chart entering camp. Ex Colgate goalie Mark Dekanich was very impressive playing a period last night giving up a goal only to fellow Pred Dan Hamhuis who accidentally scored for Atlanta in the closing minutes of the game trying to clear the puck from blue ice. Dekanich also played well in one of the rookie games earlier this week. Dekanich had one save last night (actually 3 in a flurry) that should have made the ESPN highlight reels. Eighteen year old Chet Picard who was the second Preds pick in this years draft also looked good in the rookie games early this week. US Junior goalie Jeremy Smith has also been impressive in the rookie games. Needless to say, the Preds are as well stocked in goal as they have been at any time in their history. That’s it for the Blueline and in Goal. I shall return with an analysis of the wide open competition at forward where there are open spots on the roster that will be had by someone. PREDS COME OUT ON TOP OF COLUMBUS 3-1. Tonight turned out well for the Preds. They put things away half-way through the 3rd going three up on Columbus. For most of the youngsters, it would be their last NHL game for a while. Geoff Peters, Mark Santorelli, Nick Spaling, Kelsey Wilson, and Teemu Laakso were all sent down to the Milwaukee Admirals of the American Hockey League. The Admirals start training camp on Tuesday. Jonathan Blum is going back to his team in Vancouver in the Western Hockey League. The Preds took the lead early. At 11:18 into the 1st, Patric Hornqvist took a pass off of Ryan Suter to fire in the first goal of the game. Throughout the rest of the 1st and all through the 2nd, the score remained 1-0. Finally, only 1:49 into the 3rd period, Antti Pihlstrom deflected a shot from Radek Bonk right by Fredrik Norrena. Following that at 9:20 in the period, Shea Weber sniped one from the blue line into the net. A few minutes later at 5:43, Derek Dorsett of the Columbus Blue Jackets got a nice deflect off of a pass from Ole-Kristian Tollefsen. This put the numbers at 3-1 in the favor of the Predators. That was the last of all the goals scored tonight. Dan Ellis had a terrific night. He stopped 15/15 shots he faced tonight. Pekka Rinne went 12/13 on Save/Shot. Halfway through the game they replaced Ellis with Rinne to give Rinne some extra practice. The goal that got by Rinne could’ve been prevented if Jordin Tootoo had covered his man like he was supposed to. I’d say it was an all around solid performance from our goaltenders tonight. Two youngsters that really stood out to me tonight were Patric Hornqvist and Antti Pihlstrom. Pihlstrom was digging deep in the boards racking up five hits and a goal. Hornqvist got a goal, an assist and four shots on goal. They both helped set up some big chances and have a lot of energy. These guys have a ton of potential. Tonight our power play was pretty decent compared to the past few games and seasons. We converted two out of the 9 power plays into goals. 2/3rds of our goals were scored on the power play. If we can continue to throw pucks at the net during the power play like we did tonight and stop passing it around and turning it over, we might win some more games this season. Tonight our penalty kill remained solid. 0/13 Was the final count on G/PP. Pihlstrom proved to be very helpful on the penalty kill. He’s like Scotty Nichol with a lot more energy and speed. Something that impressed me tonight was Jordin Tootoo drawing 4 penalties. He would flatten someone, then that person would get up and start screwing with him. He sat there and let the refs sort it out. Tonight during the intermission, they had a nice segment on Paul Newman. R.I.P. 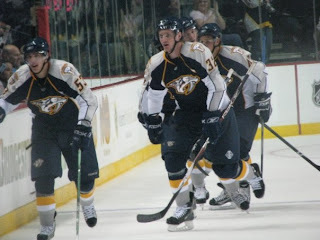 Thursday night at the Sommet Center, the Predators fell to the Thrashers 4-2. They contributed to two of the Thrashers’ goals, compliments of Dan Hamhuis and Kevin Klein. The other two Atlanta goals were shot from the blue line. It seemed that Pekka Rinna was having trouble with people screening him. The Preds took too many penalties that could’ve been prevented. They took 13 penalties and two of them were for too many men on the ice. That’s an awful penalty to take. The rest of them were preventable. They let their emotion get to them. The Pred’s power-play looks like it’s going to be a repeat of last year. They spend too much time thinking about what they’re going to do so that by the time the penalty is over they only racked up one shot on goal. That’s something that really needs work. The Predator’s penalty-kill is looking good again. Last year they ranked 3rd overall on the power-play. Last night they were letting a few of the rookies play. Jonathan Blum played just as well as any of the other defensemen last night clocking out at 18:50 ice time. Teemu Lasko also racked up over 20:00 of ice time. Rich Peverley had a career high of 7 shots on goal. Also, the rookie, Michael Ryan, got 5 shots on goal. Pekka Rinne was struggling in goal. He was getting blasted from the blue line. The D wasn’t necessarily doing their job, either. Whenever I looked in front of the net, there were at least 2 guys screening Rinne. Mark Dekanich started in the 3rd. Overall he did really well. Other than the goal that went off the skate of Hamhuis, he was solid. Chet Pickard and Jeremy Smith were sent down to their junior teams yesterday. Thousands of season ticket holders piled into the Sommet Center for some pre-season hockey action. When coming through the doors you were given two slips of paper. One was for a free meal and the other for a pass to see a certain group of players. They eventually opened up all the lines and the pass was pointless. 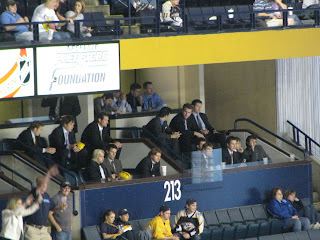 While they had these booths set up outside to meet the players, there was a game going on in the arena. 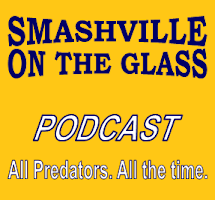 It was the rookies from the Preds and the Thrashers. Unfortunately, I was only able to watch about a period and a half of that game. From what I saw, most of the players were soaking up the moment and forgot that hockey is a team sport. Amidst the hogging were some pretty bone rattling hits. In the end, the Preds lost in a shootout on the fourth shot. I was able to meet Jed Ortmeyer who happens to be my favorite player on the team. I got his autograph. It’s a shame he’s injured again. I also went through a few other lines and got some other players’ autographs. Although they only gave out one free meal per person, I found a way to exploit this. Not going to go into detail on here. Last year we had a friend named John working on the inside giving us more than we were supposed to get. Unfortunately, after that night he was put on Pro Shop duty for all the missing meal slips. Although it was an eventful night, things will never be the same as they were years before that. This summer one of my best friends moved to Arizona. He was like my right hand man as I was his. There will be no one to hang with this year out in the halls between periods. Another fallen comrade was already mentioned, John. Apparently he walked all the way from his house to go to the Pro Shop to get things set up and he was told he had to sign up to work there. He thought he was already employed. So he basically said some stuff and hasn’t been back since. R.I.P. Mike Santorelli leads the celebratory charge after tying the game with 4:21 remaiing in the game. The Preds eventially lost 3-2 in the fourth round of a previously scoreless shootout.